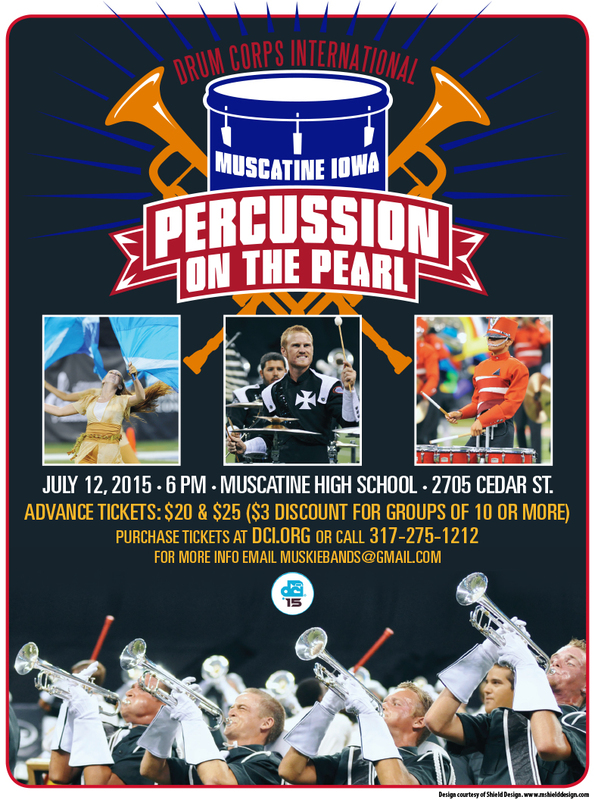 You are here: Home > MCSD News & Alerts > MCSD News & Alerts > CMS News > Percussion on the Pearl this Sunday July 12th! FOURTH ANNUAL DRUM CORPS COMPETITION THIS SUNDAY! Two corps – Pioneer from Milwaukee, WI, and Madison Scouts from Madison, WI – will arrive in Muscatine late Saturday night. The public is welcome and encouraged to stop by the high school and Central Middle School and watch their rehearsals on Sunday morning and afternoon. Pioneer and Scouts will compete with seven more drum and bugle corps on Sunday night. They are the Colt Cadets from Dubuque; Legends from Kalamazoo, MI; Music City from Nashville, Jersey Surf from New Jersey, Blue Stars from LaCrosse, WI, Crossmen from San Antonio, and Louisiana Stars from Lafayette, LA. Each of these corps are continuing their journey in the DCI Summer Games Tour, and their goal is to make it into the lineup of competitors in the World Championships held in Indianapolis in early August. We are proud that two Muscatine teens, Luke LeBeau and Teddy VanWinkle, are performing with the Colt Cadets. Luke plays tenor drums and is a 2015 MHS graduate and Muskie Band alumni. Teddy will be a senior this fall at MHS and plays trombone in the Muskie Band program. To perform in drum corps, he taught himself to play contrabass. These young men have been rehearsing with the Colt Cadets and performing in Drum Corps International competitions since the first week in June. Each drum corps comes with its own production, so there will be a lot of variety. Spectators will hear both recognizable and unfamiliar tunes. There will be hundreds of passionate kids, ages 14 to 22, who put on one of the most refined musical marching products to be seen. It’s a series of brass, percussion, color guard choreography, and dance. That pageantry will last over three hours, and it’s a family-oriented event. We’re looking forward to having a lot of people come out and enjoy themselves while learning more about drum corps. Tickets range from $20-30 and are available at the gate starting at 3 p.m. Many MHS band alumni have performed with drum corps. They include Ashley Grothe Phelps, Andrew Escalante, Mike Lee, and Nate Hunt with Pioneer; Paul Grammens, Aaron Smith, and Tara Scott Thornton with Colts; Matt Scott with Colt Cadets; Shea Burke with Racine Scouts; and Bernie Moore with Phantom Regiment. For more information, go to www.muskiebands.org.